"Johnnie Mae is a true legend of Chicago blues, and a real American songwriter.."
Contains 13 tracks from famous blueswoman songwriter and singer, Johnnie Mae Dunson. 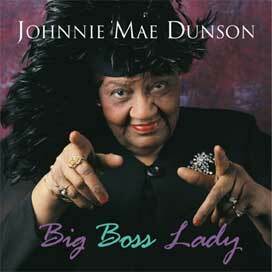 Known best for her songs recorded by Jimmy Reed and Koko Taylor, Johnnie Mae Dunson delivers the original goods on this historic cd recording. Evil, I'm a Whole Lotta Woman (her answer to Bo Diddley's I'm a Man), I'm Going Upside Your Head, I'm a She Wolf, Big Boss Lady and recent songs, Blue Sky is My Blanket, My Baby's Gone and Trouble Just Won't Let Me Be. Released by Lakada Music Co., featured musicians on this recording are Jimi "Prime Time" Smith and two of the famous Lost American Bluesmen, Frank "Little Sonny" Scott Jr. and Jimmie Lee Robinson. Johnnie Mae Dunson makes regular appearances at the Chicago Blues Festival and has appeared on the Chicago Cable TV program "Speaking of the Blues" and on WTTW's Image Union. She has been the subject of feature story/interviews in The Reader, The Daily Herald, The Sun Times, Blues Access and Blues Review magazines and on radio on WBEZ's 848 and Comin' Home programs. Order online at CD Baby. Click here.